dome over an octagonal drum. On the side walls stand slender Doric columns, and in the presbytery, a beautiful golden altarpiece dedicated to the Virgin patron saint of the town. Currently, the court has lost its original wall, replaced by iron bars, and has joined the Central Square community, taking their sides the Municipal Palace and the Market. On the side walls stand slender Doric columns, and in the presbytery, a beautiful golden altarpiece dedicated to the Virgin patron saint of the town. 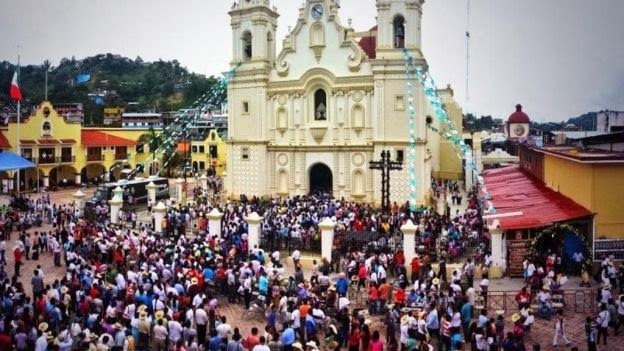 San Juan Lachao is a chatina community located in the district of Juquila, on the coast of Oaxaca. Its name means "between mountains and rivers," and precisely its natural beauty, its spectacular scenery and mild climate are some of the features that make it so attractive this Oaxacan corner. San Juan Lachao offers visitors various ecotourism, rural tourism and adventure tourism. Through ancient and lush forests and imposing mountains, live the encounter with nature, and enjoy the incomparable thrill of downhill zip line through the trees, from heights of up to one hundred meters. Discover the beauty of the cloud forests, knowing endemic species of flora and fauna as well as beautiful and high waterfalls descending from rocks and maintain their flow throughout the year. Besides the natural wealth of the community, San Juan Lachao preserves ancient chatina own manifestations of culture as its cuisine and traditions. Come and participate in the process of growing organic coffee in this area known for the quality of the grain, or known archaeological remains and cave paintings that reflect the life of the first inhabitants of the area. San Juan Lachao is about the state capital of 194 kilometers. If you travel by private transport from the city of Oaxaca take the Federal Highway 131 towards Puerto Escondido. On reaching the village of Luz de Luna (186.4 km), turn right deviation dirt to San Juan Lachao (7 Km). Total travel: 5 hours. If traveling by public transport, we recommend address in the city of Oaxaca a van to Santos Reyes Nopala, the lines "The Solteca" (Arista No. 116, between Miguel Cabrera and Bustamante), or "Conveyor Tourism of Nopala and Annexes "(Galeana No. 420, Centro, between Las Casas and Mina). In Nopala, you can board a bus or a truck cab mixed transportation to San Juan Lachao.